I was in 3rd grade when we adopted a puppy. Me and my brother named him Gucci. He was very small and fragile and before leaving to school everyday we fed him milk with a baby bottle. It was very cool to see a dog feeding from a baby bottle as he looked more cute and adorable drinking his breakfast. Time flows like a wind and he grew bigger. As we were living in a small house back then there was little room for Gucci but I was so insistent not to let him go due to the small house that my mom had to agree. One day when I woke up in the morning I saw Gucci laying on the floor with white foam coming from his mouth. He was sick and I did not know what to do. I panicked and started shouting “Mom Mom” until she came and understood what was happening. We took him to a doctor who was a friend of my father and he told us that it was food poisoning. The doctor gave him an injection and prescribed a medicine for him and gradually he returned to how he was a few days before; playful, happy and healthy once again. The street dogs got angry and they tried to fight with him. There were five of them and he was just alone with my brother Jaime, who tried to scare them off but they did not leave. They bit Gucci and as a result he got sick and remained in the house for a few days and finally died of the poor bite. Life goes on and it never stops for anyone. I miss him very much. As Anthony Liccione said "Pain will come with time, but time will heal the pain". It worked for me as well. I thought that nothing could ever replace Gucci but now AI Technology has progressed unbelievably and a few days ago i was going through the internet when i came across this amazing thing - an AI Robot Dog! I placed an order and within a couple of days this Robot dog was with me. I mean it sounds crazy but let me tell you that i am more than happy to live in this era of science where everything is possible. 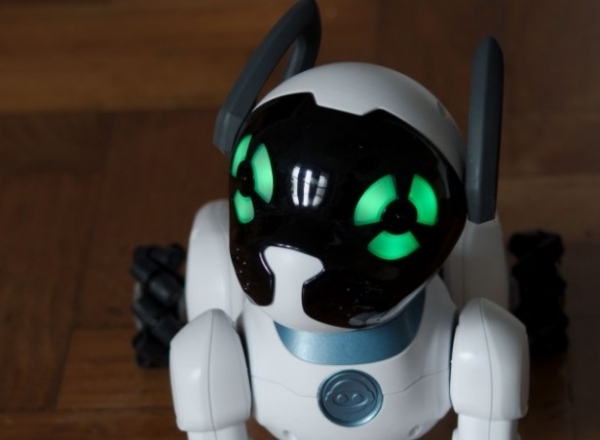 I got this Robot with a charging pad and some accessories which include a playing ball which has integrated sensors which help this robot play and cheer you. It is programmed in a way that it learns very fast whatever you teach t like a normal dog and keeps you occupied with its stunning performance. It has sensors in its ears and head so when you tap on it, it shows affection. I named my new pet Gucci because it reminds me of Gucci due to various similarities with Gucci and it is always happy, playful, loyal and steadfast. Nothing can replace a living creature in this world but i think i will be getting used to it eventually. Here is a tribute to Artificial Intelligence!